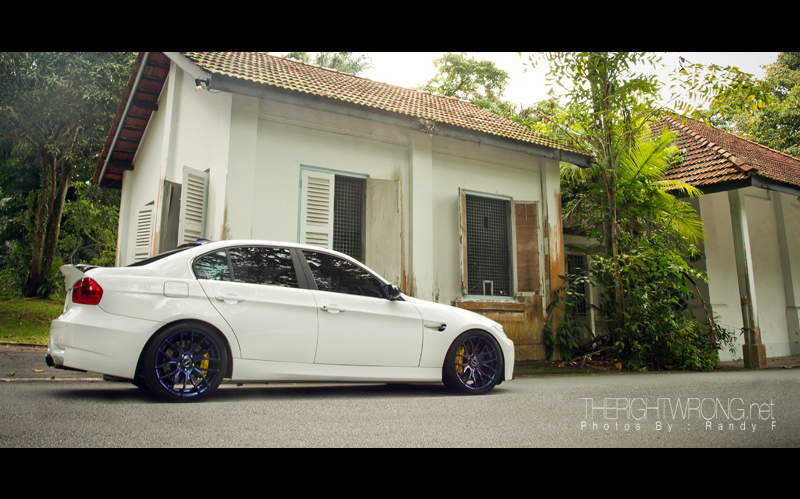 If you’re Singaporean and you are familiar with the performance car scene then you’ll probably have heard of the owner of this amazing BMW, Marcus. Marcus is probably one of the most car crazy people we have ever met with each different build being unique in its own way. That uniqueness has also been recognized with BOTH of his previous rides featured on multiple magazines and even the newspaper. Yes, uniqueness at its best. Marcus has always been one of the first every time bringing trends like coloured rims back then to Singapore, and always a trend setter. Even with his Civic FD2 long sold, there are still many following his styling cues. 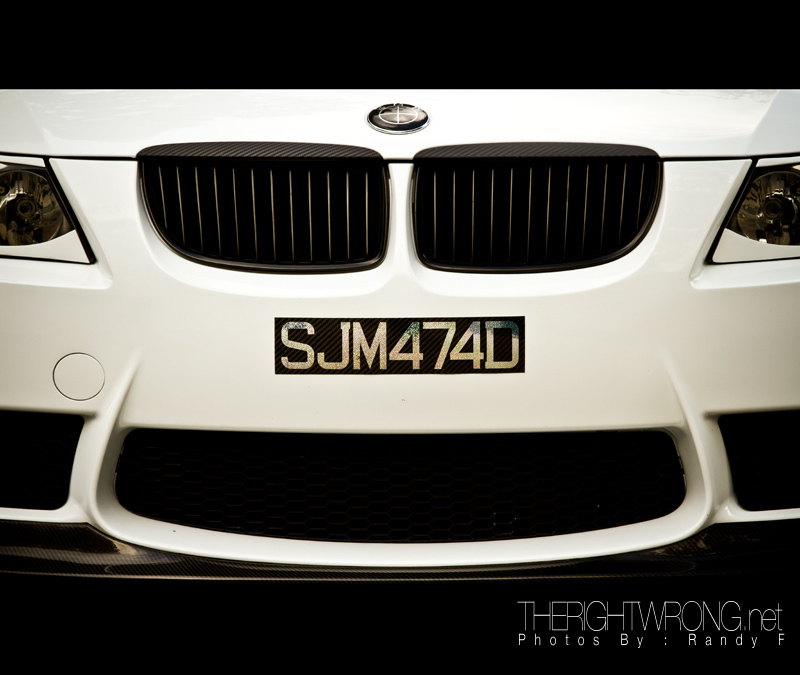 While BMW’s are a dime a dozen, we assure you it will be tough to find one that looks as unique as this. With the owner being performance obsessed in his previous two cars, this is his first stab at building a continental car with a right mix of performance, style and comfort. DAMN… Has he gotten that formula right. When we arrived at the meeting point before the photo-shoot, we got out of our cars to be hit by a whole lot of awesome. Blurple meaning black, blue and purple. The mix of black and blue crystals creates a visually stunning colour changing effect. Sitting lonely in the woods. Little white riding hood. Detail to attention even on what steering wheel he uses. And it doesn’t get any better than this. 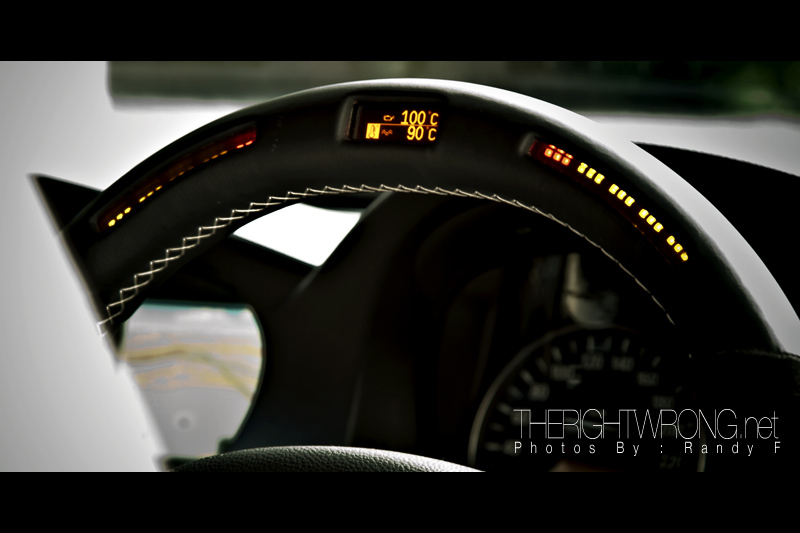 BMW Performance steering wheel that comes with shift light and integrated digital meters. Pure baller item that is! While Marcus still complains that his interior is not complete, we will keep you updated of anything more unique he can come up with. His next focus of course was to ensure all that performance has to be able to stop. Brembo GT 6pot in the front and 4pot brakes in the rear hidden behind the spokes of Breyton GTS rims. Wheel specs are 19″ with offset 20 all round. 8.5JJ in the front wrapped in 255 front and 9.5JJ 275 rear tires. Unique twin carbon wrapped titanium tipped N1 exhausts. Marcus has been staunch follower of the stance culture originating from the States, since his Civic FD2 days. 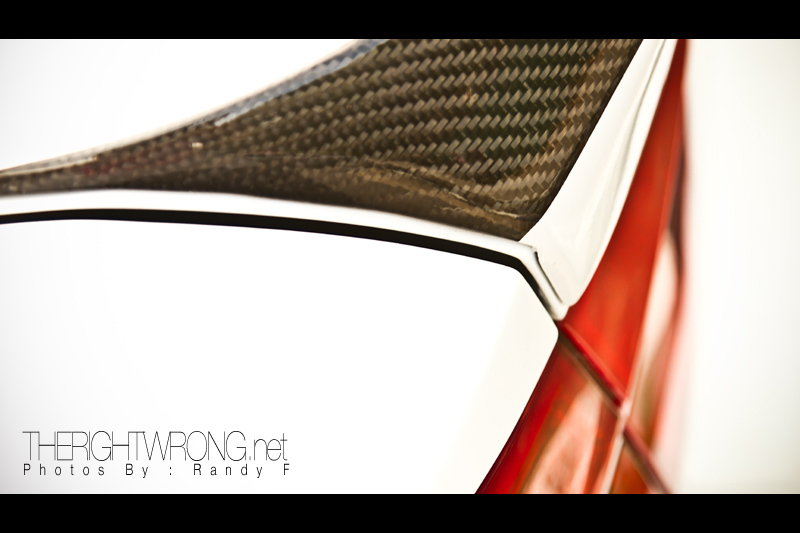 Flashing you with some Carbon Fibre goodness. With a CSL carbon spoiler sprayed mostly white for a cleaner look. One would just miss the green at the traffic lights looking at this sweet front end in their rear view mirrors. Unique all black BMW logo Marcus sourced. The car sits so perfectly with those shoes. Something you wouldn’t find in many done up BMWs here in Singapore. 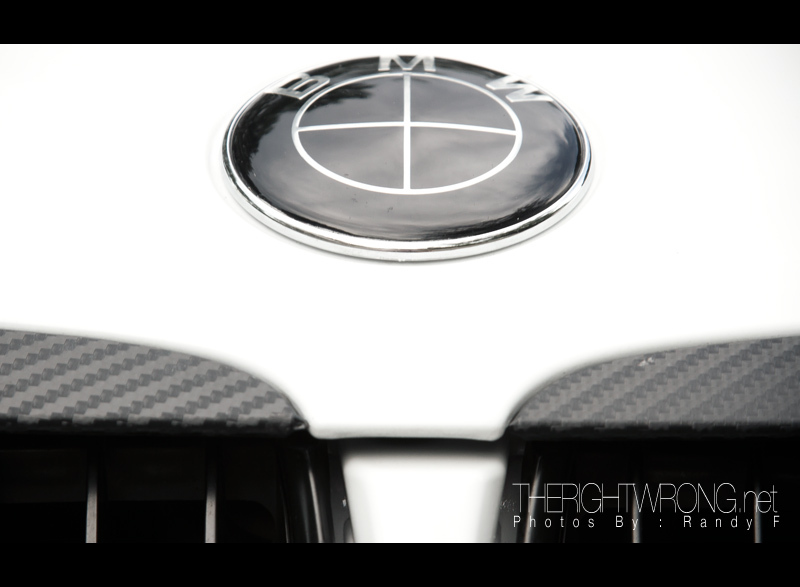 The ride is adorned with carbon fibre goodies all around, such as the mirrors and the side skirting. 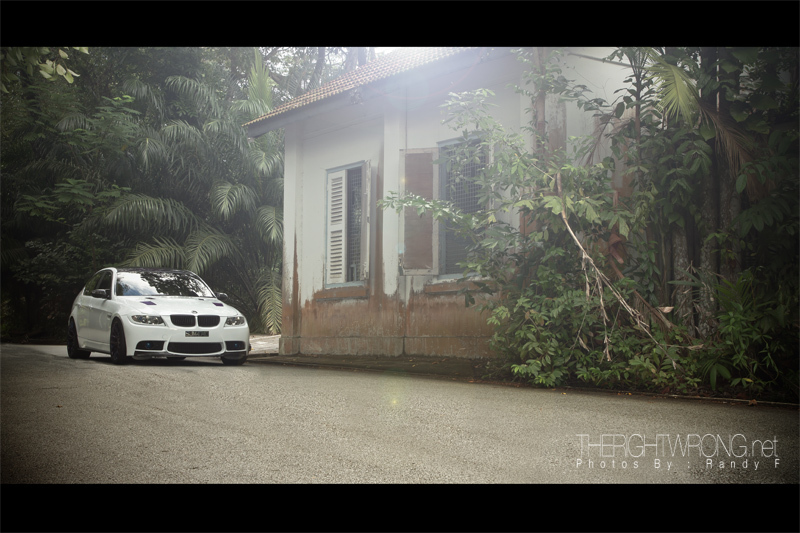 And take overall package is one that leaves Marcus beaming his beemer with joy every time he drives it. 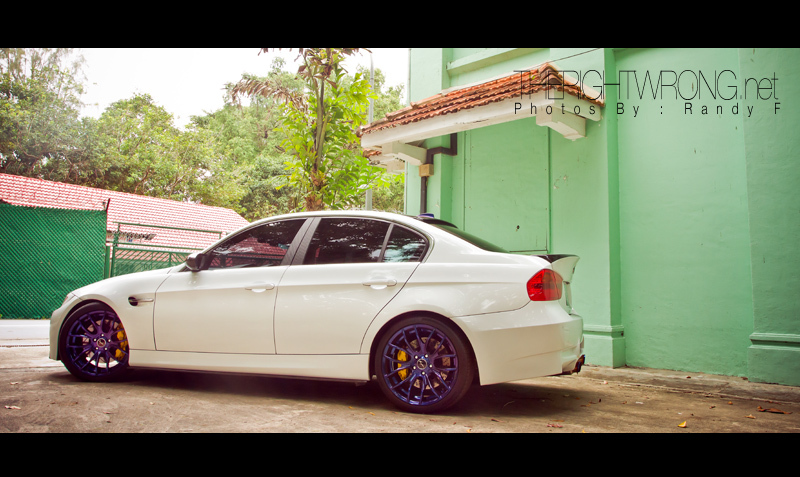 Do stay tuned to TheRightWrong.net to be kept updated on this car and many more to come.